Even if your organization does not have a lot of money, there’s no reason it can’t run successful digital campaigns. Sometimes great organizations lack the capital to devote to digital marketing. This can be especially true for non-profits, where organizations’ limited funds are spent on providing the best programing possible, leaving little for marketing. As a leader of a student group at a university, I know exactly what that’s like. My student group needs to self-generate nearly all of its funding, leaving us with what can seem like pennies to spend on marketing. But that doesn’t stop us from having killer digital marketing campaigns. Here, at Brick Factory, we have some favorite tools that you can use to execute a successful marketing campaign for little or no cost. The best part: most require no technical skills. Social media is the perfect place for organizations to start their digital campaigns. The biggest players in the social media space–Facebook and Twitter–are free for brands to use. That means you can start developing a digital presence without spending a dime. If your brand is not already on Facebook and posting regularly then now is the time to do it. Not sure what to post? Here’s a list of 31 days of social media content ideas to get started. Willing to spend a few dollars on advertising? $5 is all it takes to start advertising on Facebook. One of the best things about advertising on Facebook is that is allows you to target very specific audiences with your ads. This can help stretch your limited advertising budget by reducing the number of times your ad appears to people who have no interest in what your organization does. Using these parameters, we can be reasonably sure that the vast majority of users viewing our ads are undergraduates at the University of Maryland. So, if we spend $20 on a Facebook ad we can be confident that nearly all of those advertising dollars focus on our intended audience. Still using Twitter.com to access Twitter? Try out Tweetdeck. It’s like a Bloomberg Terminal for Twitter. Tweetdeck provides real-time streaming tweets of users you follow, engagement with your tweets, and more. Like Hootsuite, Tweetdeck can be used to schedule tweets. Unlike Hootsuite and many similar tools, Tweetdeck is 100% free. Tracking your website’s traffic is crucial to measuring how well your digital marketing efforts are working. Both Facebook and Twitter provide their own analytics services at no cost to you. Have a website? There’s a free solution for that, too. Facebook Insights provides valuable statistics about everything from trends in how many people like your page to what posts your audience is engaging with most. You can even see when your audience is online. 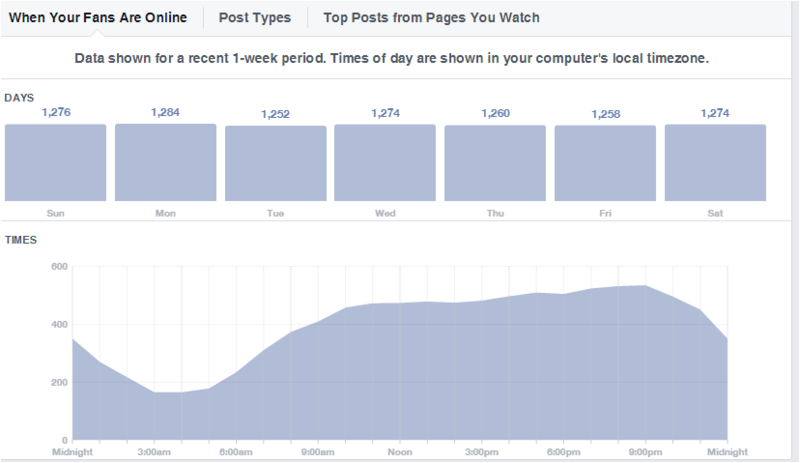 Engagement–How many people are liking,commenting, sharing, and clicking on my posts? Reach–How many people see my page’s posts? Engagement Rate–Out of the users who saw your post, what percentage of them liked, commented, shared, or clicked on it? If you’re running ads you can also find useful metrics like cost per engagement and cost per conversion. Check out Google Analytics to use the same tools as the pros without spending a dime. Google Analytics can give you basic metrics on the behavior and demographics of users on your website. For example, Google Analytics can help you see how many people visit your website, where they come from, and even what computer operating system they use. 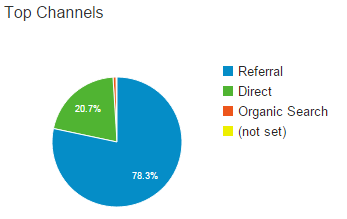 For example, the chart below from Google Analytics shows that more than three-quarters of a sample website’s traffic comes from referrals from other websites. Such a high percentage of traffic coming from referrals may indicate that a lot of other people think your content is important enough to link their users to it. Email marketing is an essential part of any digital campaign. While it is tempting to cast aside email marketing as a thing of the past, email marketing is making a real comeback. With over 67% of consumers checking email on a smartphone, email marketers can reach audiences anytime and anywhere. Start powerful email campaigns on the cheap with MailChimp. Sleek email designs. Analytics. Hundreds of integrations. Want to know if your email campaign is on par with other brands in your industry? Check out these email marketing benchmarks. Have under 2,000 subscribers and send under 12,000 emails each month? MailChimp’s free pricing level has you covered. An added cost savings for using email marketing–the simplicity. Email is something that nearly everyone on the web understands how to use, which means it can take little time to train volunteers or employees on running your email campaigns. Surveys can be a great way to learn more about what your organization’s supporters, members, clients, etc. Better, it gives them a way to have their voice heard and begin an online conversation. Check out Typeform. Unlike competitors like SurveyMonkey, Typeform helps you create forms that your users will actually enjoy filling out. For example, Quartz was able to achieve 55% completion rate on a 65 question survey sent specifically to senior executives. Even better, it allows you to create an unlimited number of forms with an unlimited number of responses on its free pricing level. An added bonus: you can even use Google Analytics to track the behavior of users taking your survey on Typeform. Following is our 2016 Brick Factory holiday card. Enjoy! How many unread emails are in your inbox right now? It’s beginning to look a lot like…the holiday giving season. And the season’s official kickoff, Giving Tuesday, is just one week away.